How could that possibly be happening; Me being on a Metal concert? Well, let’s go back in time, when my colleague at the Axel Springer Mediahouse Berlin curated artists for metal-hammer.de, which we relaunched back in June on WordPress. He stumbled upon a band called Babymetal, asking me if I put it there intentionally for fun or if it was a real band. I had no idea about it, so we googled it and soon enough, we found more and more information about it. 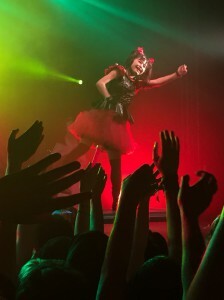 In the metal scene, the band is more often than not seen as a parody of the whole scene, because it is mixing up the J-Pop-Idol and Metal genres to create something called “Kawaii Metal”. Bringing together these two opposing genres is hard enough, fighting back against the metal fans, who do not accept this genre is even harder. But well, back to the concert. I knew their debut album beforehand, so I had a brief idea of what songs they would play. A friend of mine who joined me for the concert heard the album the whole day. He speaks and understands Japanese way better than I do (The only words I know are “Sakura” and “Gokigenyou”, which I learned from him.) So he had a brief chance of understanding what was going on, opposed to me, who was there for the amusement of being on a concert. Soon after the first song started, my friend and I were separated from each other due to the – mostly black clothed – fans jumping around. If I knew this before, I guess I’d have been standing at the side for some reason. I knew this from festivals friends of mine told me about and pictures and videos I saw, but I couldn’t imagine what power these guys had altogether. The music became seemingly soon enough unimportant to most of the visitors, they were running around in a big circle, jumping against each other. And whenever anyone left that circle – intentionally or unintentionally – he was pushed back into the group of people standing in front of the stage. All of this led to the so called “Wall of Death”, when the fans split up to the left and the right side of the room and suddenly, both sides run towards each other, jumping at each other and apparently having a lot of fun during that event. I, for myself, decided to not take part in it, wearing glasses does not seem to be a very intelligent idea during that jumping thing. The music I was listening to was about chocolate and how these girls don’t want to eat it because they fear getting fat of that, how to count correctly. Literally – my friend told me – they were singing “After one comes two, after two comes three, after three comes four” and so on. The sense of these songs may not be over the top, but in fact if you are listening to them, you are surely soon enough whipping your heat with the beat. 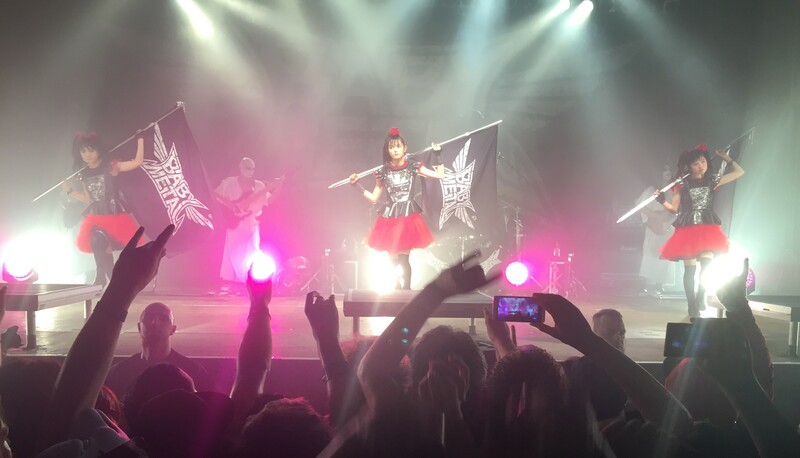 Overall, it was a good concert and obviously I had a glimpse at a music genre I was never expecting to give a try.